I’ve had peanut butter on my mind lately. I’ve mixed it through my oatmeal and used it in these granola bars. That is not even to count the times in between I’ve it spread on a slice of warm toast to accompany some tea. I love its comforting familiarity…its unfancy goodness. Peanut butter…really…sometimes one need not look far afield for gastronomic treasures. I was chatting online with my friend M (lovely M of the Moomin chopsticks) and she mentioned that she had made peanut butter chocolate chip cookies and everyone at her workplace loved it. Just take your favorite peanut butter cookie recipe and add chocolate chips she said. Shamefully, I had no such favorite peanut butter cookie recipe. Flush in peanut butter love, I searched the web for a peanut butter chocolate chip cookie recipe and this is what I came across. I’m so glad I did. – Cream butter and both sugars until creamy, then add egg and vanilla and beat until smooth. – Add the peanut butter and continue to beat until combined. – Add flour, baking powder, and salt and stir to combine. – Add chips and stir again. – Drop small spoonfuls of dough onto parchment (you should get a dozen per sheet). – Bake in a pre-heated 375F oven on a parchment-lined cookie sheet for 12 minutes. Remove from oven and let them rest on the cookie sheet for one minute before removing to cool on a wire rack. Do not over-bake them. They may seem a little underdone but they will continue to cook outside the oven. I love peanut butter cookies! But sadly, I don't have a recipe either as I never keep enough peanut butter at home to make them… I think that has to change, like immediately! I need to get back into the mood for baking… those cookies look so yummy! Like my son, I love peanut butter, too. Love Peanut Butter Chocolate Chip cookies- a suggestion for you- try making your recipe with Lily's peanut butter if you don't already. I used to use imported Skippy , Peter Pan etc. but when I tried the Lily peanut butter, we all agreed that they were the best we have made! I would have to say that it's probably due to the oil content of the Lily PB that gives these cookies such a nice consistency. Just play with the sugar quantities so they are not overly sweet. Lily’s is perfect!!! Everybody loved it! i have not had peanut butter in ages! i think i need to change that now. they look great! Hi Irene! Heehee! I know what you mean…this recipe is easy and good 🙂 I always have peanut butter here and get panicky when I start running out! Hello Domestic Goddess! Ah yes! I’ve always preferred local peanut butter over imported. For these cookies I used Lady’s Choice but next time I’ll try Lily’s (which is also my default peanut butter for sandwiches…so rich!) 🙂 Thanks for the tip! Hi Anh! Hope you get to try it out! 🙂 It’s a wonderful combination! Hi The French! Haha! Yes, hard to believe right? It's so special how simply bringing cookies to the workplace brightens people's day. It's the little things like that that make life life. perfect combination indeed! I love peanut butter and this is one heck of a combination..
Hi Joanie! I love this combo! Hi Jo! I admit, I also didn't have a favourite recipe… until now! They do look yummy – and surely they are super rich and gooey – right?! Yum! Peanut butter cookies were actually the first thing I could bake properly, so these brought some bittersweet memories to mind. this looks great. It can trigger uncontrollable craving for peanut butter. This recipe looks easy to memorize. 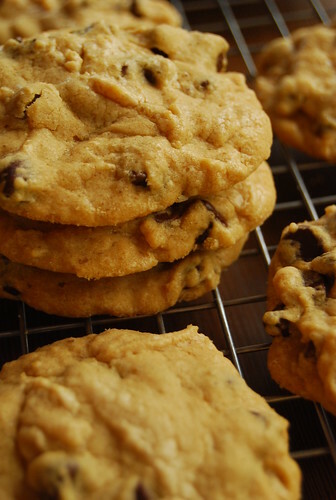 Peanut butter cookies have always been my favorite and then you add chocolate…delicious! Hi Chef Yoji! I always have an uncontrollable craving for peanut butter, trigger or no! Hi Katrina! I get nervous when my peanut butter supply runs low! OMG…must make that cake! Hi Jessica! This combination is truly a winner! Hi Katrina! I’ve always liked the local peanut butters better because they always seemed sweeter and more sinful to me (yes, even as a kid I gravitated towards the sinful!) 🙂 In any case, isn’t it the best with the oatmeal?? Love it! Hi Emily! Hope you like them! OMG I heart Reese's peanut butter cups! I am so going to try this! You take such great pics. I'm adding you to my blogroll tomorrow sweety! Na-night! Thanks DW 🙂 Hope you like these — just take care not to over-bake them and they are really best on the day they are made 🙂 Hope to see you again soon! I'm gonna try these with home-made cashew butter….OMG I hope it works because it could be insane…. Hello Bad Home Cook! Oooh, cashew butter! I can imagine that being awesome…please do let me know how it turns out! Any alternative to parchment paper? What if I put it directly to my cookie sheet?